Some pain behaviors appear to be automatic, reflexive manifestations of pain, whereas others present as voluntarily controlled. This project examined whether this distinction would characterize pain cues used in observational pain measures for children aged 4–12. 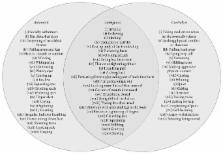 To develop a comprehensive list of cues, a systematic literature search of studies describing development of children's observational pain assessment tools was conducted using MEDLINE, PsycINFO, and Web of Science. Twenty-one articles satisfied the criteria. A total of 66 nonredundant pain behavior items were identified. To determine whether items would be perceived as automatic or controlled, 277 research participants rated each on multiple scales associated with the distinction. Factor analyses yielded three major factors: the “Automatic” factor included items related to facial expression, paralinguistics, and consolability; the “Controlled” factor included items related to intentional movements, verbalizations, and social actions; and the “Ambiguous” factor included items related to voluntary facial expressions. Pain behaviors in observational pain scales for children can be characterized as automatic, controlled, and ambiguous, supporting a dual-processing, neuroregulatory model of pain expression. These dimensions would be expected to influence judgments of the nature and severity of pain being experienced and the extent to which the child is attempting to control the social environment. Copyright statement: Copyright © 2017 Kamal Kaur Sekhon et al. An empirical examination of the "pain-behavior" construct. Osteoarthritic knee pain: a behavioral analysis. Observers' proficiency at identifying pretense acts based on behavioral cues.